It is hot. I wipe droplets of sweat from my forehead and squint as I feel the burn of sunscreen in the corners of my eyes. I am standing knee deep in clear water surrounded by tiny mangrove trees about a meter high. In the distance, large mangroves rise up and block my view of the ocean, obscuring the fact that I am on a small, remote island in the Caribbean. 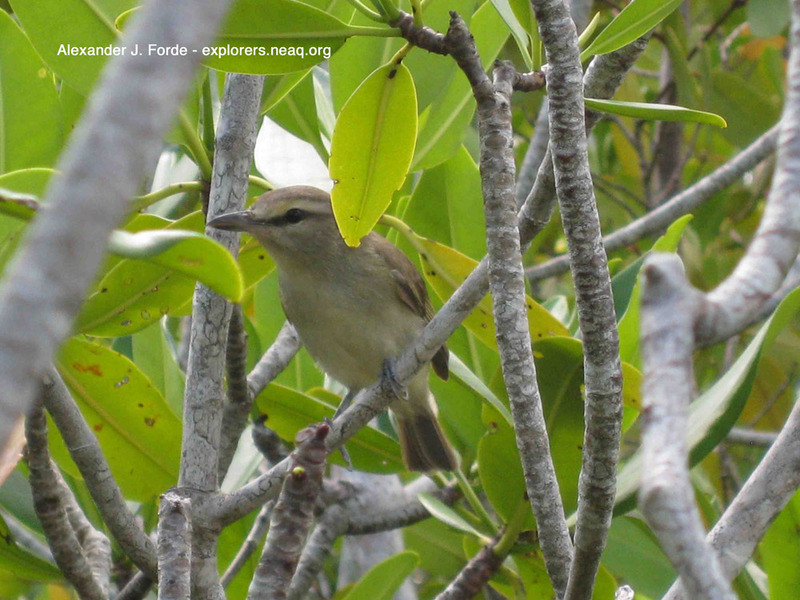 As I trudge across the flooded peat swamp, I am distracted for a moment by the "chirp chirp, tweet tweet" of the Yucatan Vireo, a gray bird about the shape and size of a robin. As usual, the bird is invisible in the foliage and my weak attempts to coax it out with my own rendition of its call are unsuccessful. I continue my shuffle across the soft peat and, off to my left, an entire school of fry suddenly leap out of the water, having been disturbed by a hungry pack of larger fish. Later, I hear a huge splash followed by the screaming and flapping of birds, which I chalk up to the foraging of a crocodile (as mentioned in Daniel's previous post). Most people could guess that the latter two sounds were death-knells of predation, but few would associate bird song with mortal attacks on prey. Interestingly, it is exactly the association between birds and predation that is motivating my work on the island. Predation by birds can have very important effects on herbivorous arthropods, such as driving the evolution of warning colors, or decreasing damage to plants and consequently increasing plant productivity. 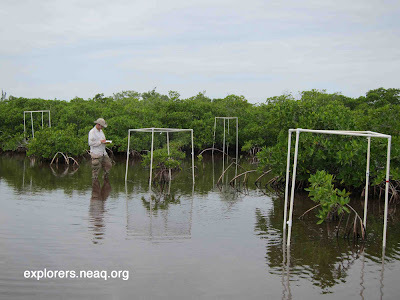 The mangrove forest is quiet when I reach my destination: a pair of cubic frames made out of PVC pipe that are built around small mangrove trees. One frame has netting over it to keep out birds and the other has no net so that the birds can enter. I measure how much the trees have grown since the frames were built and record the arthropods and damage present on the leaves. I notice serpentine leaf-damage, which indicates the presence of a tiny leaf-mining caterpillar, irregularly shaped areas scraped by tree-crabs, and circular areas chewed by free-living caterpillars. The tree inside the frame with netting even has a borehole into one of its branches through which a wood-eating larva recently entered. With help from my collaborators I had established 20 pairs of these frames on the island 3 months previously. This simple experimental design involving bird "exclosures" has a rich history of detecting long-term impacts of bird predation in other habitats and after this study is completed, it will help us understand the ecosystem function of birds in mangroves. 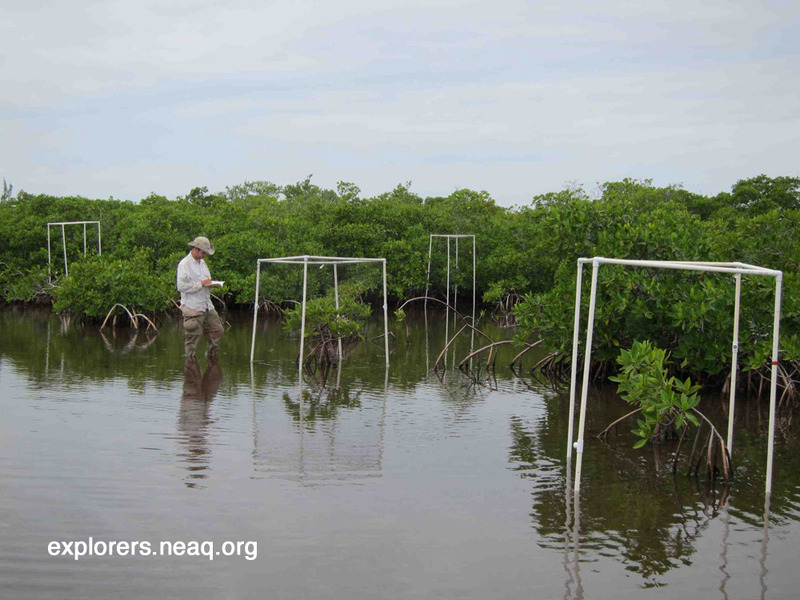 If birds do have strong ecological effects on arthropod assemblages and on mangrove growth, then they will need to receive more attention from land managers who seek to conserve and restore mangrove forests. 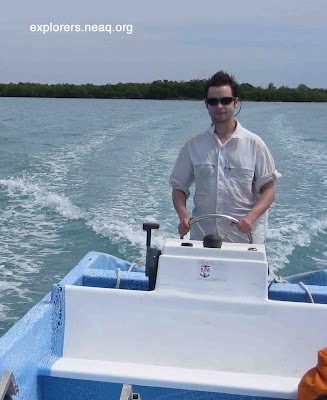 As I set out in the motorboat that takes me from the Carrie Bow field station to my field site, I make a mental check list of activities for the day. I have finished surveying the bird-exclusion frames for this trip, so now I can shift my attention to side-projects. Today all I need are plastic bags, water and a lunch, because I am going to be collecting the pupal cases of a caterpillar that eats mangrove leaves. The last time I was on the island, I found that all sorts of insects invade these cases, sometimes killing the developing moth inside and sometimes setting up shop after the moth has already left. I tie up the boat to the trunk of a mangrove on the edge of the forest and work my way through the dense stand of large trees that extends along the exterior periphery of the island. I finally enter the more open central domain of the island with a few new scratches on my arms and legs, and begin to search the undersides of twigs for pupal cases. As I scan for suspicious irregularities on the branches from a distance I notice a bump on one nearby branch. I walk over to get a closer look and, sure enough, I have found one of my targets. The oblong case is 2cm in length and is rounded, with the exception of the flattened trap door at the top, which allows the adult moth to emerge. I carefully remove the case from the branch with some difficulty, as the adhesive silk that the caterpillars use to anchor themselves to the branches is extremely tough and strong. Into a bag the case goes, and later I will dissect it and try to reconstruct the history of invasion that has taken place. 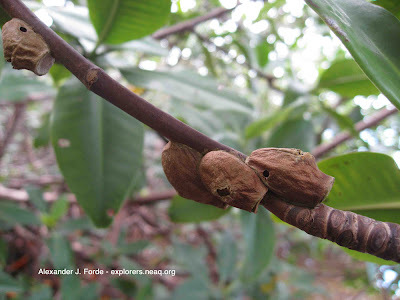 I am concerned with these pupae because it is possible that the population dynamics of certain mangrove herbivores are affected to an equal or greater extent by invertebrate predation, compared to bird predation. Pupal dissections have revealed that the pupae are often attacked by parasitoids and ants, so invertebrate predation is likely to be important for this species. My goal is to quantify the relative effects of different predatory taxa on this focal herbivore, and to test whether the extreme patchiness of its spatial and temporal distribution results from the effects of one or all of its natural enemies. Predation on this species may be important for mangrove productivity, as the caterpillars can remove large amounts of biomass during periodic outbreaks. Motoring away from the mangrove island for the last time on this expedition, I look back at the edge of the mangrove forest. I wonder to myself what I will find waiting for me in the bird-exclusion frames the next time I return, and I imagine all of the interactions between individual predators and prey that I will never see in person, but that will be collectively captured in statistical patterns in my data. I feel happy that I will be able to return to this fascinating place soon, and that, one day, the bug-bites, scratches, stinging sunscreen-tainted eyes, and sunburns that I acquired as part of my work in the forest will have been suffered for a worthwhile purpose: helping communities better understand and preserve beautiful and beneficial Caribbean mangrove ecosystems. Essentially, a parasitoid is an organism that, during its development, feeds on the inside or outside of a host animal and by doing so eventually causes the death of the host. In this post, the parasitoid mentioned that attacks the mangrove-eating caterpillars is a type of fly. Often, this type of fly lays its eggs on leaves, the caterpillars eat the eggs accidentally while feeding, and then the eggs hatch inside of the caterpillar. The fly larva that emerges from an ingested egg burrows into the caterpillar and feeds on the caterpillar's tissues until it is ready to pupate. At that point it exits the caterpillar and shortly thereafter the caterpillar dies. I went to Belize last January with Westfield State... it was amazing! i loved it there & cant wait to go back. I remember our one day trip to the mangroves and snorkeling there. We didn't get to see a croc but we did see a manatee, many fish, and a couple of stingrays. The roots system there and the things that grow on them are so cool! Its incredible how important this ecosystem is for the ocean and its creatures. So jealous you get to do research there... I hope to one day!